My best friend growing up was not into the usual play date fare; no Barbie dolls or playing school for her. What she really loved was art, so when we knew she was coming over, my mom would let me pick out an art kit at the local toy store. A go-to favorite was a pin making kit. We would pour the clay into the molds the night before, so that when my friend arrived the next day we could get right to painting our new jewelry. Try as I might, my pin never turned out as cool as the box made it look like it should be. Unfortunately, “try as I might, but never” became the refrain I associated with most of my ar tistic endeavors. Try as I might, my coloring never looked as beautiful as my mother’s, who outlined each part of her picture with a firm bold stroke before coloring in the space in between in a gentler hue. Try as I might, my construction paper snowman was never as cute as the model the teacher had taped to the board for us to copy. While other students struggled with reading and multiplication tables, I inwardly stressed out about art class, since I could never make the product match the vision in my head. By the time I got to high school, I had given up on artistic creation completely, electing to take art history and art appreciation courses rather than studio arts to fulfill that portion of the graduation requirements. Despite my own uneasiness with producing art, when I had my first son seven years ago, I anxiously awaited the moment he would be old enough to grasp a crayon or run his pudgy fingers through finger paint. This felt like a second chance to get good at art, and in my impatience to recapture (or maybe experience for the first time) a child-like joy at creating, I picked out projects that were wildly beyond his ability level and then felt frustrated and disappointed when they did not hold his attention for more than thirty seconds or when the final product was not aesthetically pleasing enough to hang on the fridge for all the world to see. Fortunately, I had wiser friends around me, and from them I learned some crucial lessons about doing art with children, namely, to follow my children’s lead in terms of their artistic interests and to focus on the process more so than the product. When I see the joy that my sons take in making something new, I can better understand what it means to affirm God as Creator, not just at the beginning but as an ongoing force in the universe. Rather than being hemmed in by fear and uncertainly, as I was growing up, God (and my sons) create with excitement, with hope, with an eye toward possibility, and out of the desire to see what might be and with the trust that what might be will be good because the Creator wills it to be good. Like my son gathering up the waste from our table and making something new, God nudges us to remember the parts of ourselves that we would rather forget and empowers us to use them to make the world new. God is present with us in the times of the deepest sorrow and biggest regret and finds a way to make something beautiful out of the tears and ashes, because that is what Creators do. In an ef fort to tap into the joy that comes with creation, last week I met a good friend at a craft store, and she helped me pick out yarn and needles. This weekend she is going to give me my first knitting lesson. It is my fervent prayer that I can learn from my sons, focus on the process of creating something with my hands rather than harshly judging the product as not quite good enough, and connect with the Creator who knit all of us together in our mother’s wombs and who continues to fashion us in Her image. Ever since I moved away from Washington, D.C. nearly three years ago, I find myself in the midst of some strange weather event whenever I return. The day that I was scheduled to speak in front of the Supreme Court was no exception. Nearly a week after the official start of spring, our capitol city welcomed me with freezing temperatures and a heavy, wet snow, but the weather couldn’t put a damper on the rally, attended by hundreds of advocates defending access to contraception under the Affordable Care Act. As I spoke from the podium about my faith and my commitment to advocating for contraception access, the crowd whooped and hollered at all the right moments. It was a true highlight of my advocacy career. What I wanted to say at the rally but felt like I couldn’t (or shouldn’t) was that I was ten weeks pregnant—and that thanks to my access to contraception, my husband and I had been able to plan our pregnancy. I can’t even imagine what the response would have been! But the idea of displaying that much vulnerability was too much. I wasn’t ready to make my pregnancy quite so public. Therein lies the tension of my life as an advocate. Where does the self fit into advocating for others? For the last four years I’ve dedicated my ministry to advocating for global maternal health and universal access to contraception from a faith-based perspective. As a woman of childbearing age but with no experience of pregnancy up until this year, I could relate to the need for contraceptive care, but the world of safe motherhood was another story. I leaned on others—biblical mothers like Rachel and Mary, advocates from Kenya and Sierra Leone, statisticians with solid facts—to fill in my perceived gaps. Finding out I was pregnant abruptly shifted my perspective on the work I was doing because I could start to weave my own experience into the tapestry of stories of women past, present, and future. But I struggled over when would I make that apparent to the outside world. Would I ever feel ready for this work to become more intimate and personal than it already was? I felt my call to advocacy when I was in seminary and saw how few faith voices there were in the world that affirmed the dignity of women and girls. God broke my heart through the stories of women’s suffering and pieced it back together with the hope that I could partner with the divine in creating a more just world. Each day I approach my work as a holy practice, as ministry. The times when I feel most connected to the church have not been during traditional worship, but rather in the midst of teaching and learning with fellow advocates who share my commitment to the least of these. With these brothers and sisters I have experienced the beloved community I always longed for. I pour myself into the work and do so gladly. But soon after I become pregnant, I realized that suddenly, I was no longer in a position to give in the same way. In fact, I was the one who was in need of ministry. Truthfully, the first trimester of pregnancy was anything but a spiritually deep time. I spent most of it tending to what felt like an unrelenting case of the flu—nausea, debilitating fatigue, and dizzy spills. I hardly had the energy to shower, much less engage in thoughtful theological reflection about maternal health or brainstorm new advocacy strategies for my project. I resented how my days had been reduced to just getting by until I could crawl into bed again. What was worse than the physical discomfort was how miserable I felt about my lack of productivity. My self-esteem took a massive hit when I realized I could not push through the pregnancy fatigue and had to put nearly everything in my life on the back burner. Worst of all, I was suffering internally and not allowing others in to provide the support I needed. 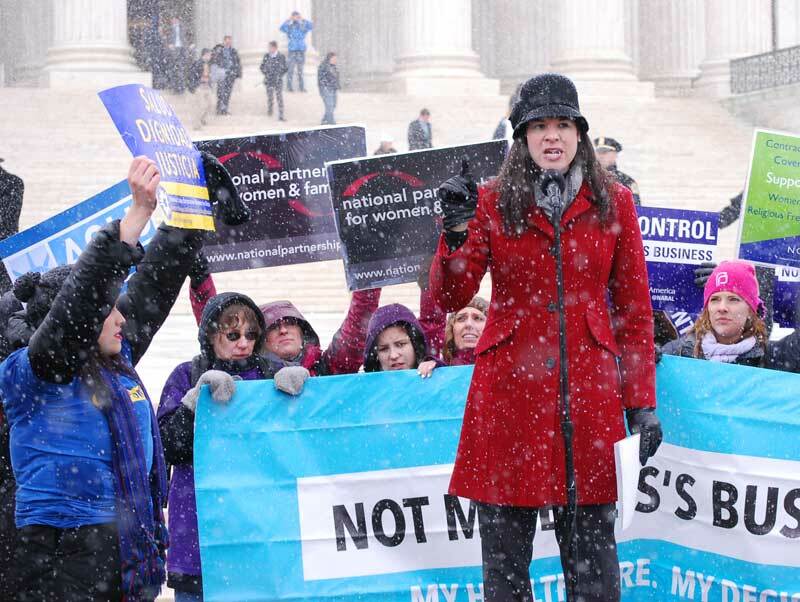 As I stood on the steps of the Supreme Court, nausea and fatigue in full swing, I somehow mustered up the energy to advocate for the millions of women whose access to health care was at stake. Suddenly it hit me—I wasn’t just advocating for other women; I was advocating for me! I had to ask myself, why is self-advocacy so difficult for me personally? How can I speak passionately about the need for others to experience health, abundant life, and well being when at the same time, I have trouble listening to my own needs for the very same things? For me pregnancy has been an exercise of constantly letting go of any semblance of control I thought I had. I’ve had to learn and re-learn daily how to turn inward in order to listen to my body, mind, and spirit without resistance. Sometimes it’s about stepping aside to let others lead in my place, canceling speaking engagements, or taking longer to finish writing pieces (like this one). But, I am learning that this is part of self-care. Learning to advocate for myself is part of my ministry. Not Just An Other Mother, A Guest Post By Kate Lassiter, Ph.D. I have never been pregnant or subsequently given birth vaginally or by Caesarian, but I have been a mom. My sister lived in South America during the time of my niece’s conception and birth. I flew down within that first month of her birth and stayed with them for 2 months. As they returned to the United States, they came to live with me during the year that I was finishing my dissertation and applying for teaching jobs. From the outside, it is easy for me to see how this makes me an “other mother” in the eyes of many—or no mother at all. But I saw myself as a mom to my niece. I held her when she cried in the middle of the night and made decisions that were in the best interest of all of us, not just me alone. I watched and taught how to roll onto her stomach, crawl, eat solids, play with sundry toys, and walk. Rosmarin’s article falsely assumes that a woman without child equals choice to not raise children. Choice, however, is a delimiting concept. As a theologian, being true to who I am has nothing to do with whether I have chosen to have children or not. I think here about all the abbesses—mothers—in Roman Catholicism, the tradition I know best. Abbesses mothered small children and adult children in multiple contexts—physical, emotional, and spiritual. Some of their children were only with them for a brief period of time; some, much longer. For me, I became a mom for a brief and intense time during my niece’s first year of life; I continue to be part of her life in a mother-like role, as my voicemail attests when I miss a call where she announces that she’s gone “pee pee in the potty.” Raising a child is not just childrearing and it is not always a free choice. Like many choices that we assume to be free choice, but are actually constrained, becoming a mother is a constrained choice, and sometimes made under less than ideal conditions. Still, constrained choices do not lack the capacity for incredible personal spiritual growth. Perhaps we could even say that the constraint makes possible the conditions for that growth. I may not have freely chosen to become a mom, but it changed me in a way that revealed to me more of who I am, not less. That’s something that all theologians, ministers, and faithful people should consider when we ask a woman if she is a mom. Dr. Lassiter is an assistant professor in Religious and Pastoral Studies at the College of Mount St. Joseph. She graduated from Vanderbilt University with her Ph.D. in Religion and from the University of Dayton with her M.A. in Theology. Her primary research and teaching interests lie in the critical investigation of theological practices of ministry and faith, formation of the self, and advancement of social justice with marginalized and excluded persons. This entry was posted in Uncategorized and tagged Care of Children, Choice, Kate Lassiter, Maternal Identity, Othermothering. Consumerism has been a topic of great concern in my teaching, research and parenting practices over the course of the Fall, and especially now that the Christmas shopping season is upon us. (I actually had to tear myself away from shopping on Amazon to write this post!) I am currently teaching a course on Religion and the Environment, which culminates this week with an exploration of religious resources for subverting the culture of overconsumption that is destroying not only the planet, but also human bodies and spirits. This culture, which has been manufactured to meet the profit motives of market capitalism, consumes its subjects with dissatisfaction, anxiety, and insatiable desire. It cannibalizes the lives of other human beings who pay the price (in low wages, poor working conditions, environmental injustice, etc.) for privileged communities’ access to cheap and convenient consumer goods. And it devours the planetary ecosystems and atmospheric conditions on which our lives and well-being depend. In her most recent book, Blessed Are the Consumers, Sallie McFague argues that “we are living in la-la land, a place that has no relationship to the finitude of our actual home, planet earth. We are living beyond our means, both financially and ecologically. We are consuming with an insatiable, and unsustainable, appetite” (18). If we are to face this reality honestly and create a world in which other human beings and the planet as a whole can survive and thrive, posits McFague, then we the relentless over-consumers of the Global North must practice restraint in our personal and public consumptive practices and learn to share the world’s limited resources fairly. It is in this process of kenosis, or compassionate self-emptying, that we might overcome the dissatisfaction and anxiety of consumer culture and find true self-fulfillment. As a Christian theologian with liberationist, feminist, and ecological commitments to justice and sustainability, I couldn’t agree with McFague more. As a suburban, middle-class mother of three young children, I am struggling with how to incorporate the practice of consumer kenosis into my family’s everyday life. Over the past half-century or so, middle-class parents in the United States have become excessively anxious about the health, safety, comfort, and future academic, social and professional success of our offspring. In an attempt to protect, enrich, and entertain our children, we implicate ourselves in whole markets of vastly unjust and unnecessary systems of production and consumption that exploit other human beings and contribute to ecological destruction. Most middle-class parents like myself are a long way from even imagining a world in which the material comfort and entertainment of our own children are relativized, let alone sacrificed, for the sake of children across the world and the health of the planet as a whole. Parenting, it turns out, poses a unique and troubling obstacle to the kenosis of consumer culture. I have found that my gendered role as a mother also plays into this challenge in very unsettling ways. Since I have made the choice to stay at home to care for my young children, I am responsible for acquiring, organizing, storing, cleaning up, throwing out and giving away most of the consumer goods that enter our household. When I first became pregnant, I found it surprisingly easy to get sucked into the massive and manipulative marketplace of baby registries, birthing balls, bella bands, nursing nightgowns, and parenting books. After the birth of our first child, my husband and I began to accumulate (by choice and by chance, and mostly under my maternal direction) inordinate amounts of ‘stuff’: baby equipment, clothing, stuffed animals, toys, books, DVDs, arts and craft supplies, play dough, and much much more. Even when we don’t do the shopping, it all just keeps coming as gifts, hand-me-downs, preschool-made crafts, and so on. Rather than spending quality time with my children, I dedicate precious hours of each day to the frustrating and spiritually deadening task of maintaining all of their stuff. When and how will it end!? As Christmas approaches, I am finding it immensely difficult to restrain (and re-train) my consumer desires vis-à-vis my children. I know what I should do—I should go delete all (or at least most!) of the items I just placed in my Amazon shopping cart in the 15 minutes prior to writing this post. I should spend time studying and implementing some of the counter-consumerist resources offered through organizations like Center for a New American Dream (which sponsors a “Simplify the Holidays” page) and Advent Conspiracy. I should take the time to purge my household of at least half of our stuff (as suggested by Kim John Payne in Simplicity Parenting). And, finally, I should take a spiritual step back from the frenzy and contemplate, really contemplate, what it means that the infinite power of Divine Love became human flesh in the womb of a peasant woman, was born in a cold stall in the occupied territory of ancient Palestine, and was laid in a manger far from his parents’ home, all for the sake of compassionate solidarity with a suffering world. I suspect that all the practical tips in the world will not help me to counter consumerism without the practical transformation that can come from this (or some other form of) liberating contemplative practice. Do you hope to counter your own complicity in consumer culture this Christmas? If so, what helps you to restrain your consumerist desires and how do you find the freedom to focus your time, energy, and resources on what really matters? This entry was posted in Nurturing our Spiritual Practices, Uncategorized and tagged Christmas, consumerism, contemplation.